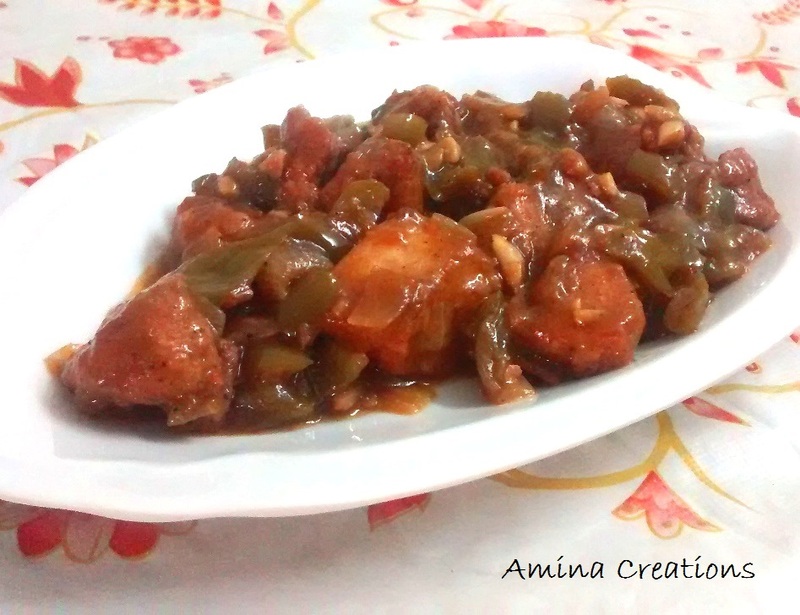 Chinese cuisine is one of my favourite cuisines and I often cook Chinese food at home. Chinese fried rice, chicken manchurian, kung pao chicken, chilli gobi, and gobi manchurian are some of the most popular Chinese dishes whose recipes I have shared in this blog. 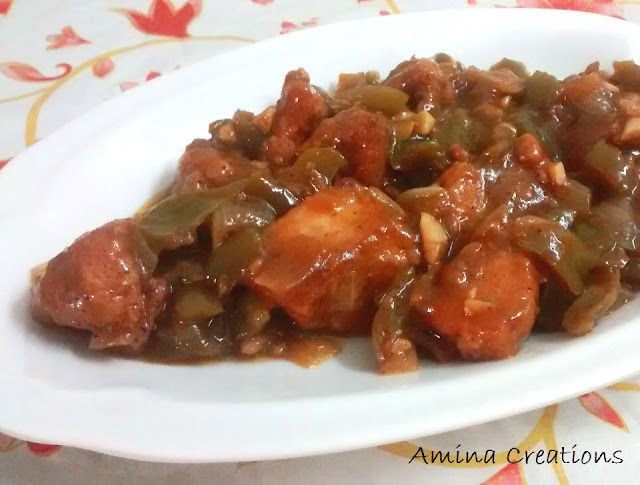 And today's recipe is a spicy, tangy and delicious recipe of Chilli chicken that you can serve for iftar with fried rice or hakka noodles. First to prepare the marinade, take a large bowl, add all the ingredients of the marinade and mix well. Add the chicken pieces to this and coat the chicken well with the marinade. Allow the chicken to marinate for 3 to 4 hours and then heat oil in a kadai (pan) and deep fry the chicken pieces till golden brown in colour. Now for preparing the gravy heat oil in a pan, add chopped garlic and ginger and sauté for some time till the raw smell goes and you get a nice aroma. Then add sliced onions, spring onions, green chillies and capsicums and stir fry for 2 to 3 minutes till the onions and capsicums turn slightly soft. Then add all the 3 sauces along with vinegar, pepper powder, salt and sugar. Mix all the ingredients well and bring to a boil. Now add corn flour dissolved in 1/4 cup water and mix well. Cook till boils appear and finally add the fried chicken pieces, stir well and cook in low flame for about 5 minutes. Transfer to a serving bowl or plate, garnish with spring onion greens or coriander leaves (optional) and serve hot.